The Carisma Racing 4XS is a high performance 1/10th competition 4WD buggy. It was designed and engineered from the ground up by legendary German RC designer, Michael Vollmer to do just one thing; win! Michael has been responsible for the cutting-edge product designs utilised by premier RC brands such as Serpent RC, Team Durango and Robitronics. 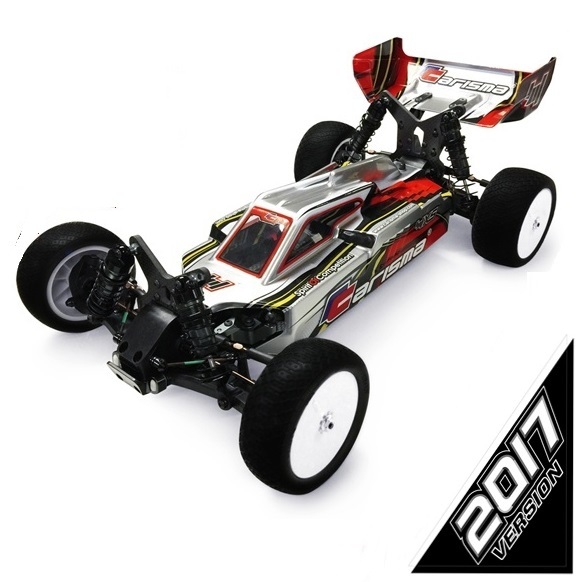 The Carisma 4XS was born out of a passion for RC racing and presents the RC racer with a truly uncompromised design combining new chassis and driveline innovations with stunning on track performance. But, at its heart, is still the simplicity of construction and ease of chassis tuning that keeps racing fun! Since 2015, the Carisma Racing 4XS has been raced globally on many surfaces and around many challenging tracks. Our engineers and team drivers have completed thousands of hours of real world testing and further component development. From this and customer feedback we redesigned the differential gears in order to let you enjoy more on-track time and racing, between maintenance and re-builds. New materials are used in the latest differential gear and the gears themselves are now much lighter, thus reducing rotating mass, improving the buggy’s acceleration and enhancing the braking. The new material is also stronger and able to withstand the use of more powerful brushless motors and the stresses associated with racing on high traction surfaces. The differential input gear has been modified to reduce the need for maintenance. This reduction in maintenance in turn lets you concentrate on the most important things for any 4XS owner; racing and having fun! With the new modifications in its design, we truly feel that the 4XS now offers the ultimate tuneable 4WD race platform and that the Carisma 4XS 2017 will help any racer reach a new level of achievement on the track. · Various tools; hex drivers - 0.05”/1.5mm/2mm, screwdriver, hobby knife, curved scissors, etc.